The Universitat Politècnica de València (UPV) is a public, dynamic and innovative institution that is dedicated to research and teaching in the fields of science, technology, art and business. The UPV maintains strong bonds with its social environment and a strong presence abroad. Our vocation as a service results from our commitment to society. We provide our students with the knowledge they need to be able to work as graduates and post-graduates in their professional field, and we offer them an all-round education where they acquire technological skills, as well as a humanistic and cultural education. The UPV is a prestigious public institution of international renown which maintains its good position on the main national and international rankings of higher education institutions around the world, year after year. UPV believes in student and staff exchange programmes, providing guidance and support regarding foreign academics, researchers and students. For that reason, UPV is leader in Spain in the Erasmus Programme and during the past academic year 2.437 students made use of this programme. UPV has a great experience in teaching agricultural subjects; in fact the School of Agronomy was the most ancient and one of the founding faculties of UPV. In 2006, due to the necessity of professionals in plant breeding, the Master in Plant breeding was created. The quality of this Master was recognized in 2016 with the Award of the best master at UPV at the XV Awards of the Social Council of UPV. The teaching staff of the master has both a broad teaching and researching experience. Many of them perform their research activity at the Instituto de Conservación y Mejora de la Agrodiversidad Valenciana (COMAV) which was created in 1999 as research center in charge of managing the Genebank of the UPV and breeding the horticultural crops preserved there. Nowadays the COMAV is a reference center of plant breeding with 2500 m2 of state-of-the-art research labs, a germplasm bank, and core services, including, genomics, in vitro culture, microscopy, and bioinformatics facilities, as well as a total of 3000 m2 of greenhouses and 25 growth chambers which allow plant cultivation in different controlled conditions. All these facilities are available to be used in the practical sessions and master thesis by the master students. 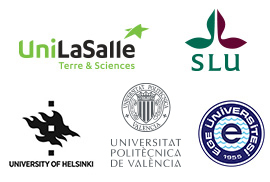 In addition, many external professors and professionals (from universities like UPC and UPM, and Research centers such as IVIA and IBMCP-CSIC, among others) collaborate in different teaching activities to keep lectures updated and close to the complex and exciting reality of the plant breeding sector.